This product was one of the high-profile products at the “Summer Stationary Festival 2013”, which I featured last week in our Japan Style, for its first-in-the-industry concept. Based on his experience and with his passion for stationary, after the productions of 40 trial models for 1 year, Mr. Daiki Abe, a member of the company, finally succeeded in market the product, “standing note cover”. At the business meetings, you often take notes knowing that you have to input all the written data into the computer afterwards. When keying them into the computer you have to look down to the notebook. 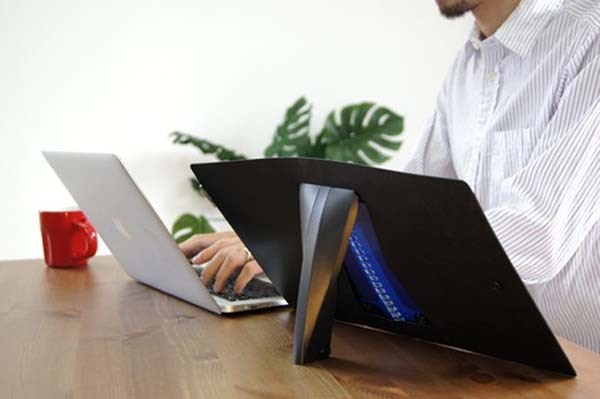 With the “standing note cover”, however, you do not have to look down anymore. 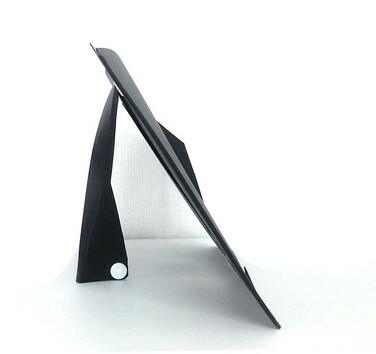 With the attached leg at the spine of the cover it transforms to a standing cover. Its smart design will not let you bothered by the pages which keep turning. If you want to cook with a recipe book in the kitchen, the “standing note cover” will help you too. Covers come in 3 sizes, B6, A5, B5 in both black and white, and will go on the market in September 2013. The price range is between 1,600 yen and 1,900.